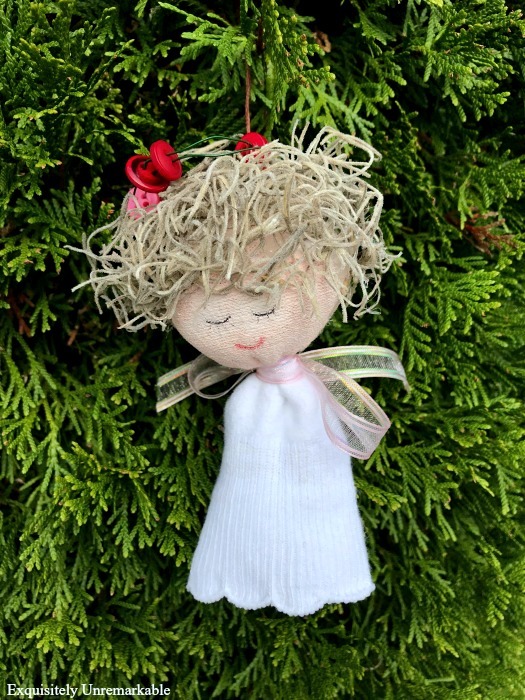 Learn how to make a very simple sock angel ornament for Christmas using baby socks. It's an easy Christmas craft and super sweet. Ho Ho Ho Friends! 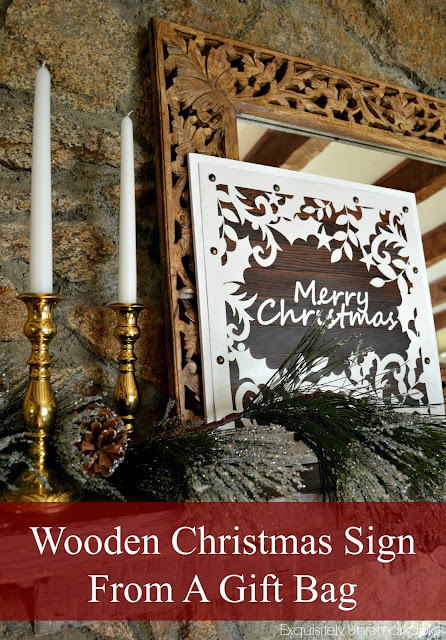 Christmas is my favorite time of year, and even though it's still a few months away, I say it's never too early to get a jump on those holiday crafts. 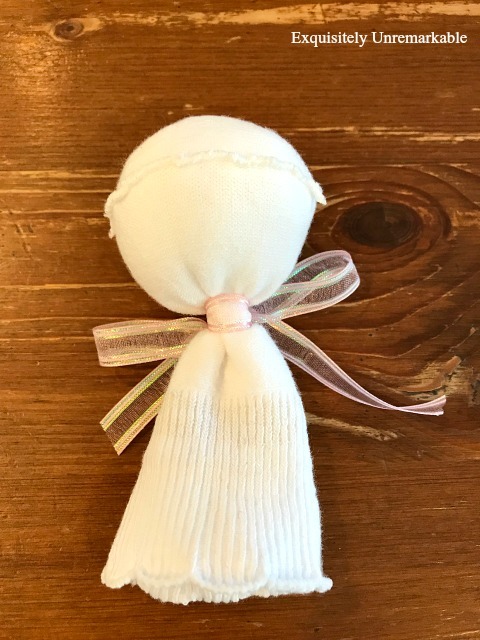 I love creating my own gifts, decor and of course, ornaments, like my latest and greatest, a darling handmade sock angel. She's a mini version of the sock angels I made last year. I was so smitten with them, that this year I thought it would be fun to create some for the tree. 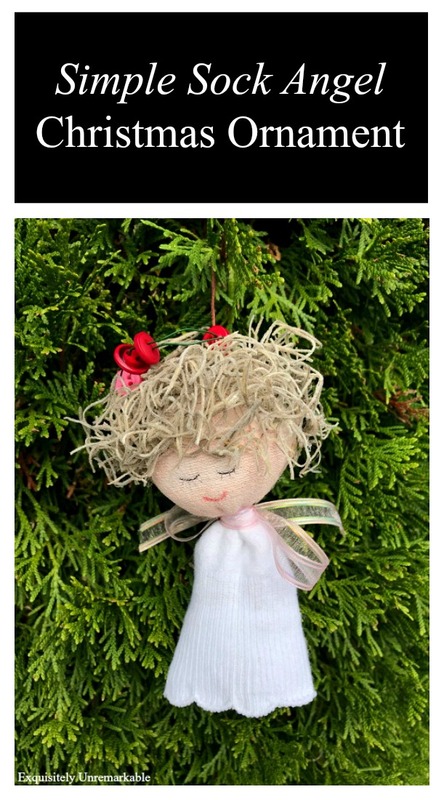 This DIY also makes a perfect gift for Baby's First Christmas. Just add the baby's name and the year to the bottom on the sock in fabric marker or you can embroider it on if you're really talented...or add ribbon that you can write on with a fabric marker and use that as wings. 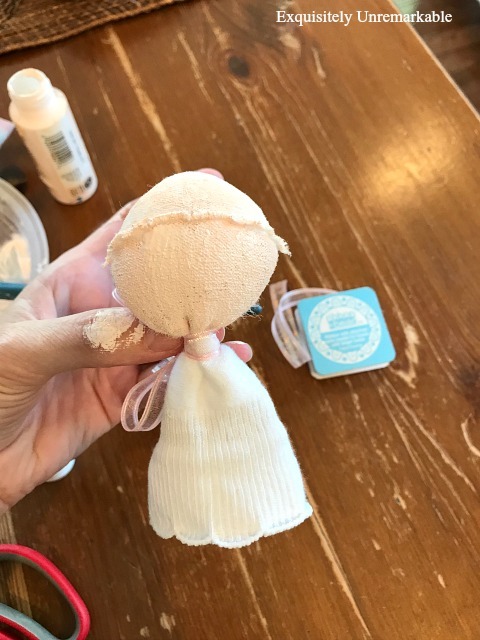 Ok, now I know that some of you are going to look at this craft, see a doll and say, nope. Too hard. Too involved ~ but trust me, this one is easy. Super simple is my signature style, remember? I began by gathering a few supples. Baby socks were the main ingredient. How cute is that? I chose a pair with ruffles so the angel's dress would have a little flair, but that's up to you. I had the rest of the items in my craft closet, but here's what you'll need. So I started by turning my baby sock inside out. This hid the rubber writing on the sole and it made the toe seam more prominent, which helped define the face area. Next, I opened it and stuffed the toe with a round ball of poly fill. To create a head, I secured the stuffing in place by tying a piece of ribbon underneath it, in a bow. This also created the decorative wings. Next, I painted the entire head and face with flesh tone craft paint. I used a bristle brush and applied two coats, paying special attention to the face, where I needed the paint even and flat. I didn't use fabric paint, because I don't plan on washing her. However, if you have fabric paint and want to use it, go right ahead. I'm a big believer in using what you have on hand. 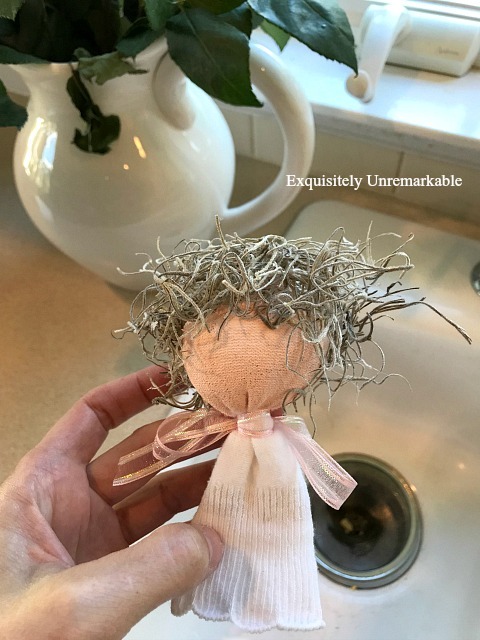 Once the paint was dry, I grabbed a handful of Spanish Moss and hot glued it on to her head. Now, this stuff is very, very messy to work with. I suggest doing it over a piece of paper or a sink, because it will get everywhere and it's a pain to clean up. I glued the moss on in a very haphazard manner. When I was happy with the coverage, I grabbed my scissors and gave her a little haircut...just like I used to do with Barbie. But with much better results. Then I took some floral wire, wrapped it around my fingers twice to create a circle and threaded a few red and pink buttons on it to make a garland for her head. I secured it with hot glue. I used a needle and embroidery thread to make a hanger. I poked the needle through the top of her head, made a loop, then a knot. I did all of these tasks first, to make sure that the paint was totally and completely dry, before working on her face. When I made my larger sock angels, I painted the faces on. However, this girl is tiny. I used infant socks and detailed painting is not my strong suit. So I used two fine point markers to add sleepy eyes and a mouth. She's ready for the tree. And like I said, super easy. Now I really can't wait for Christmas. Are you ready to see a few more ornaments? 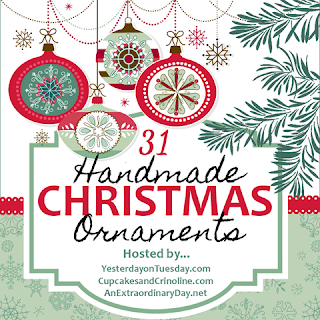 Well lucky for you, I'm participating in 31 Days of Handmade Christmas Ornaments. Let the handmade fun begin! Be sure to check back each day as the month progresses to see what's new! 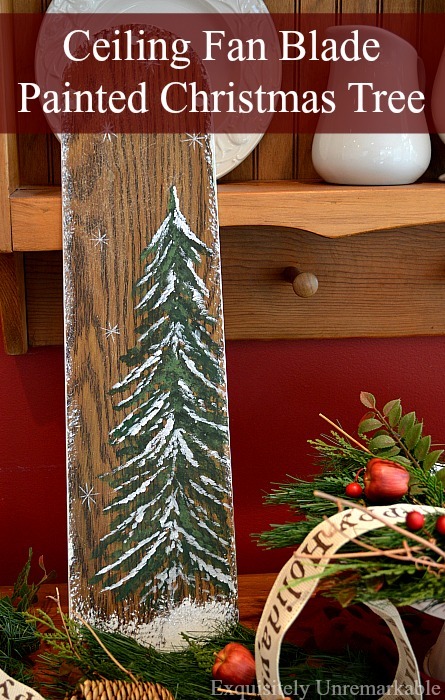 Check out some more easy Christmas crafts! She is so adorable. You did a beautiful job making her. I change my tree around every few years. Some years I have a tree with all hand made ornaments. I even put on the ones the kids made for me years ago and I mean years ago. I have about 6 that are over 30 years old they made. Thanks Betty! I had fun with this one. We have some really old ornaments, too. I have a few from my own childhood and ones the kids made when they were small. It's always fun to pull them out, isn't it? Pure sweetness! 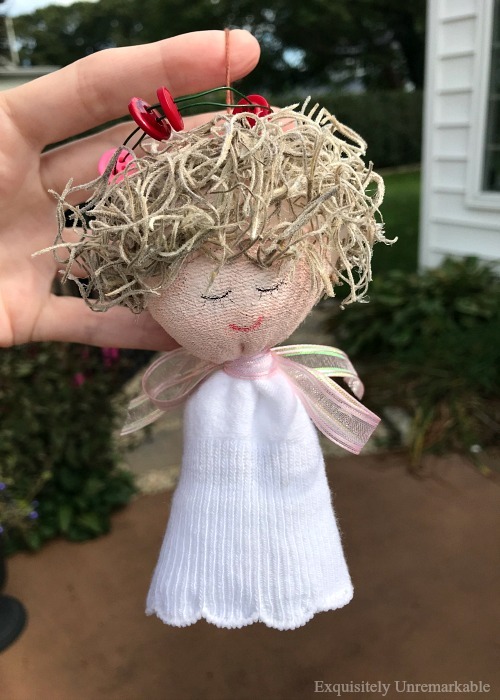 I LOVE your little sock angel, Kim! Every detail is exquisite and your angel's face is just precious and you made it look so easy. This sock angel is so sweet. 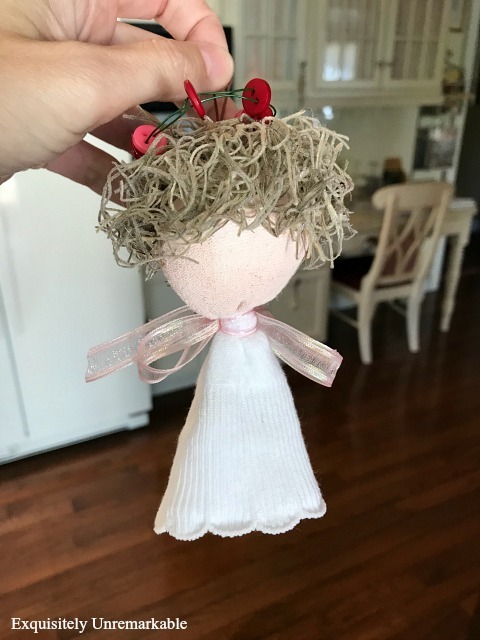 I still have an little angel that a friend made for me years ago. For some reason I always put her in the kitchen? She's bigger than your but I love how easy your instructions look and the fantastic result. Thanks for the inspiration. Thanks so much, Patti! I made a few larger ones last year and I keep one in my kitchen, too. Great minds...Thanks for the visit. Sooooooo cute Kim. Love this one. I still love the sock angel you made for me last year. Just makes me smile. I need one of these for my angel tree that I do at Christmas. They are just adorable. You need to sell these seriously!!! You are so creative. This is the sweetest thing! What an adorable little angel. You were so clever to create it from an infant sock! This would look wonderful hanging on my sentimentally decorated tree. Thanks for sharing! Thanks so much, Richella. This little one has stolen my heart and she was so easy to make! Thanks for the visit! Your little angels are darling! Wouldn't it be cute to have a bunch of them on a tree? Also, they would make great gifts for baby's first Christmas. Thanks Stacey! And I was thinking the same thing...or as a bow on a shower gift or welcome baby gift...I may have to make some more. This little angel is so sweet, Kim! Now I know I have to make a few for my youngest granddaughters. I know that I've got a whole bunch of socks that are single and would make perfect candidates for this Christmas ornament project. So so pretty! Thanks Judy! I am smitten myself. I may have a house full of them by Christmas. HaHa! Ah! 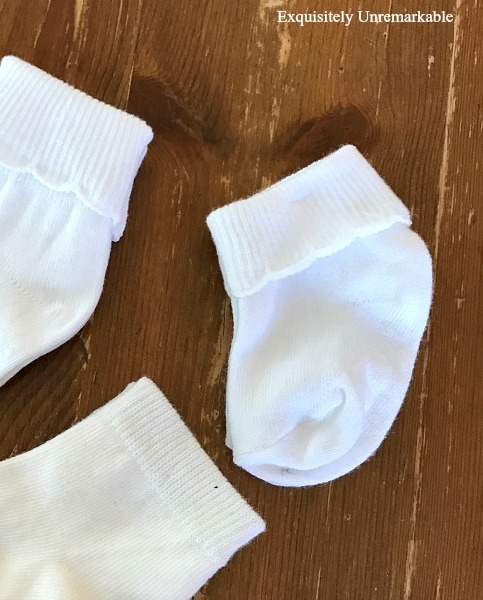 I LOVE these - what a great way to make use of my daughter's baby socks that she's outgrown! Cute, cute, cute! Thanks Jennifer! I thought the same thing. I’m going to have to dig out a few of my kids’ baby socks, too. Thanks for the visit! What a very sweet ornament! Perfect for all the angels in your world! Thanks Lynn...what a sweet way to put it! Glad you came to visit. That sweet angel is so adorable! Thank you, Gina! She was a quick and easy DIY! Oh, my! This is this is the sweetest little angel. I love her! Thanks so much, Paula! She's been on my mind for a while, so the hop was great motivation to get her done. I really appreciate the visit...thanks for popping by! This is just the sweetest ornament. What a lovely little face. Great idea to use the sock. Easy and creative. Thank you so much, Lisa! I had a lot of fun whipping this one up...and yes, super easy! Thanks for the visit! Thanks so much, Teri! I had fun with this one. I just love looking at her sweet face. Adorable! Can't wait to take my sweet angel from last year out. I had to put it away because my kitty liked to chew on her hair. No chewing allowed this year. I might have to make a few of these! So cute and easy. So very cute. I pinned and I pinned a few other of the ideas shared as well. I love the rustic birch / pinecone. Thanks Carla! I really like this one and I too am enjoying the hop. That pinecone is outstanding, I agree! This is so cute. My mom decorates her tree with snowmen and I wonder if there is something similar that could be done to do a snowman? Your angel is adorable. That would be so cute, Lorri. I may have to try that next. I would just stuff and stitch up the bottom, paint the face with a little white paint so it would be a clean, flat palette to add a face and then add some kind of hat. Super easy and I bet super adorable, as well. I have to add this to my list! Thanks!! Hi Kim, I love your cute angel you made. This looks like a fun ornament to make from a sock. thanks for the tutorial. Thanks Julie! 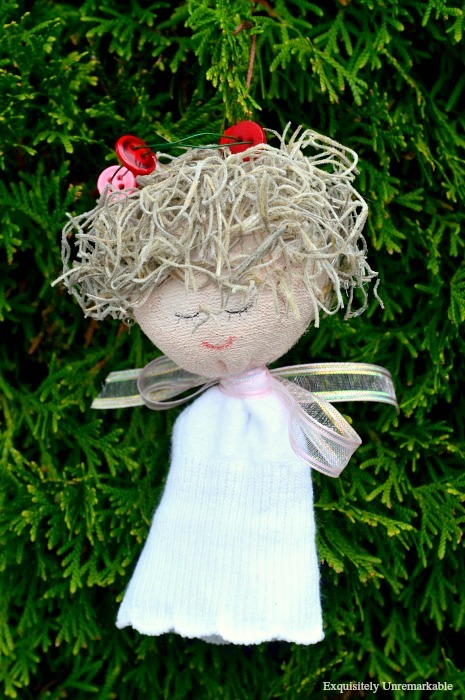 Now if I could just manage to learn how to crochet...then I could make a crocheted sock angel!! I love your beautiful angel, Kim. She is so cute and pretty! 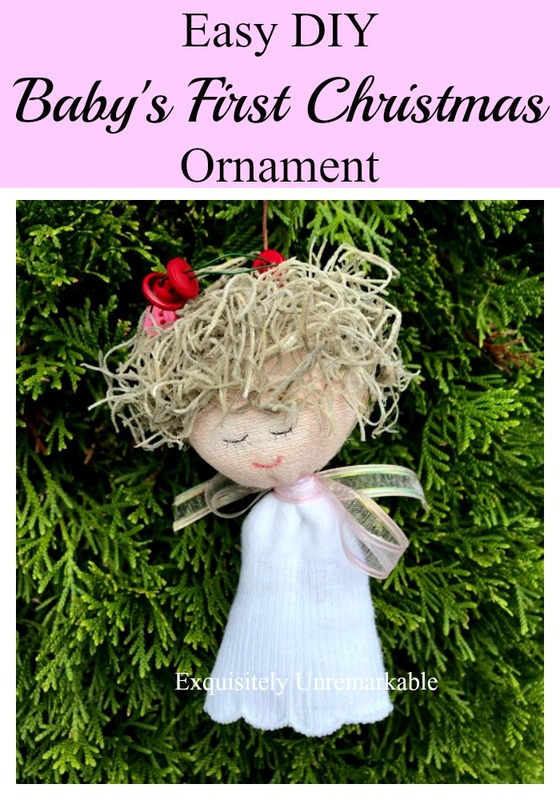 It is an easy craft and maybe I will make some for Christmas. You inspire me! Kisses, my friend! Thank you, Mia! I had a good time making this one. It is so easy. If you make some, let me know! These are just adorable! Pinned! Aww, she is so adorable Kim! And you made the process sound so easy. Even a craft-challenged person like me could do this, I believe! Love the sweet little halo too. Who would have ever thought of doing it with wire & buttons? Pinning. Florence you could totally make these...they are so easy! And thank you for your sweet comment. As far as the wire and buttons go, I always try to use what I have on hand...and that's what I had! 😊Glad you like it! Oh so cute! You did a good job! It will be adorable on the Christmas tree!! Thanks Angela! I think it would make a really sweet baby’s first Christmas ornament, too. You’re so talented you could whip one up for that new granddaughter in no time. She is so cute! 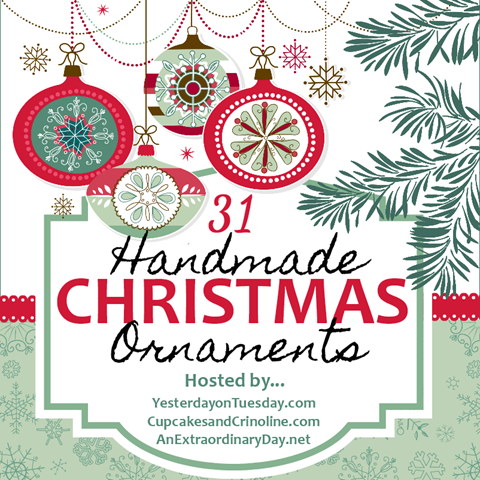 Love easy to do ornaments. Thanks for sharing. How sweet, reminds me of vintage handmade ornaments! Thank you so much, Stephanie! That's the best compliment! She is so sweet, Kim, and just the sort of project my niece likes so I'll suggest that to her. I have a whole stack of baby socks, I only ever use them as lavender sachets so it is excellent to have another idea. Thanks for sharing! What a darling way to decorate your Christmas tree. Each one is sweet filled with Christmas spirit. Thank you for sharing and inspiring me. It's quite frightening how soon the Christmas Season will be upon us, so it's always a good idea to get in early with great ideas and suggestions. Thanks so much, Jan...and ye, I can't believe how soon the holidays will be here! Oh my goodness, she is so dainty, and pretty, and perfect in every way! I just love her! Thanks Mary Beth! Can't get a better compliment than perfect! Thanks Holly. She was so easy to make! She is so sweet Kim!! Such a sweet ornament idea! Why thank you, Lindsay! This one was super simple. What a sweet ornament ... so clever too! Thanks so much, Malia! And thanks for including me in the hop. Lots of creative, crafty inspiration for sure. Thanks so much! I'm a little smitten myself. This is just so stinkin' adorable! Love it! Kim, this is such a great ideas! Your angel is such a cutie. Thanks so much, Amy! I can't wait to pop her on my tree this weekend! Thanks Rose! She was a fun one to make. This is absolutely the cutest Kim! A bit too late for this Christmas, but I will be making some for the 2018 Christmas. ...and love the idea of a bow for a baby gift! Thanks for sharing and Happy New Year to you and yours!! Thanks Charlotte! I'm so glad you like her! I have to make more next season, too. Happy New Year and thank for the comment! She is so adorable! Sweet little face, and love her button halo!